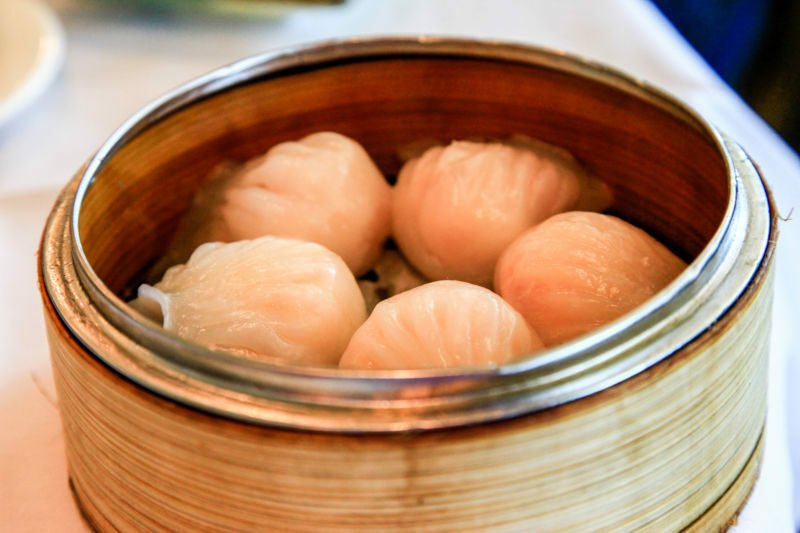 Have you ever had Dim Sum? It is the Chinese version of Spanish Tapas; Many small bites of different dishes and tastes. 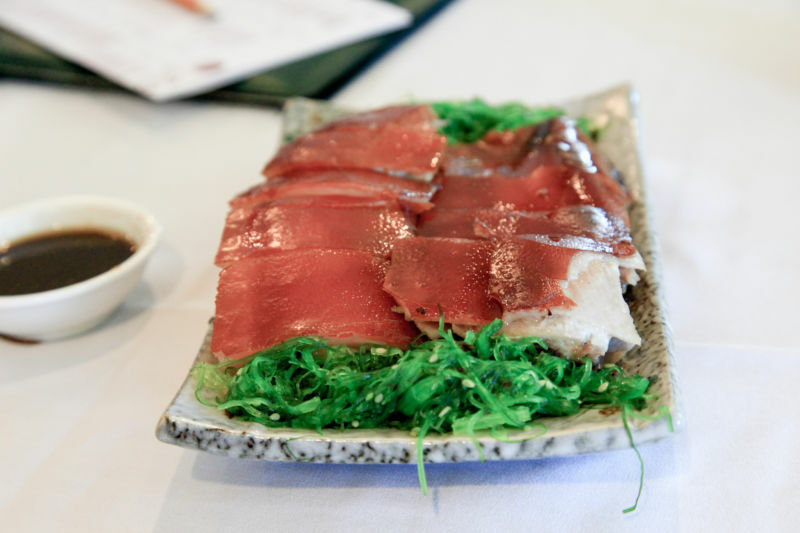 One of the very best places to experience Dim Sum is Hong Kong East Ocean Seafood in Emeryville. We were first taken there by a friend who hails from Hong Kong. 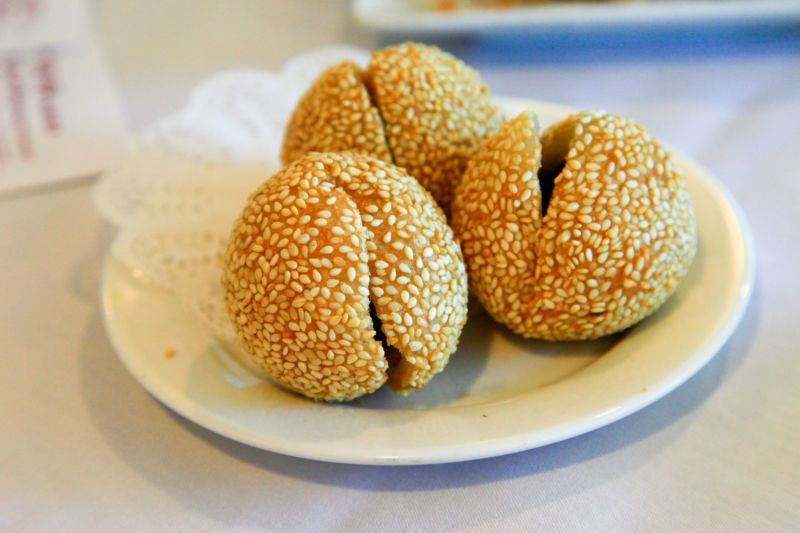 She assured us that this was one of the best places to get Dim Sum in the Bay Area. 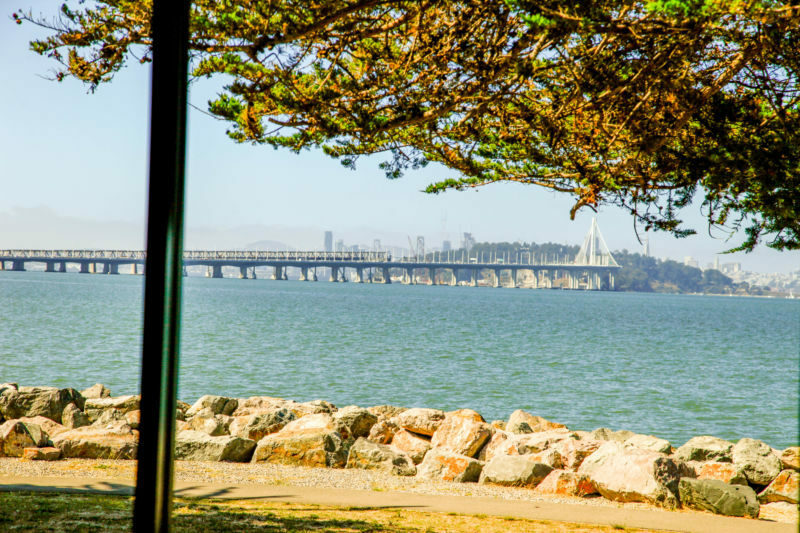 Set right on the edge of the bay, this restaurant has spectacular views of the city and the water. 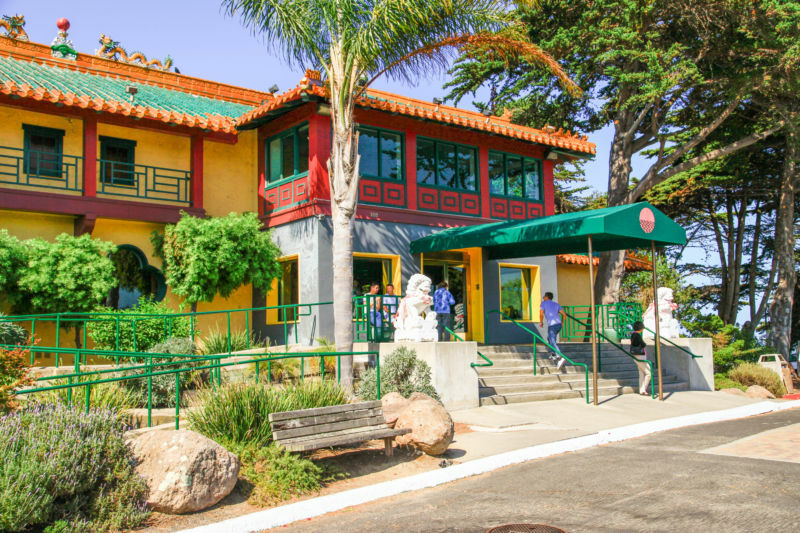 The entire restaurant has traditional Chinese architecture and accents. It is a pretty place, with its lush gold, red, and green dragons. As you enter the lobby of the restaurant you are given a number which is called up on the screen when your table is ready. It is all very organized and efficient. They have huge fish tanks there to entertain you while you wait. *Note* This place gets really packed so I would suggest that you make a reservation. The menu is written in both Chinese, and English. 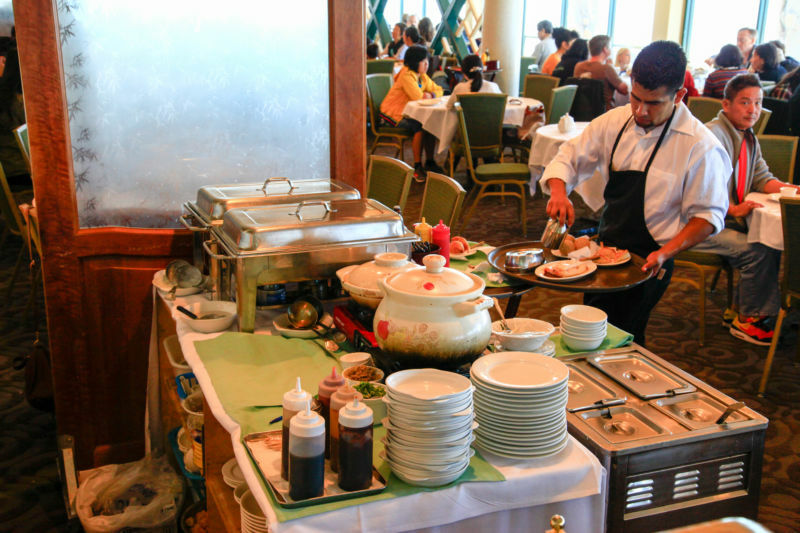 If you aren’t sure what you want, they bring carts around to each table to show you all the different dishes. Don’t count on the servers speaking English. You might have to do a lot of pointing at dishes that look tempting. 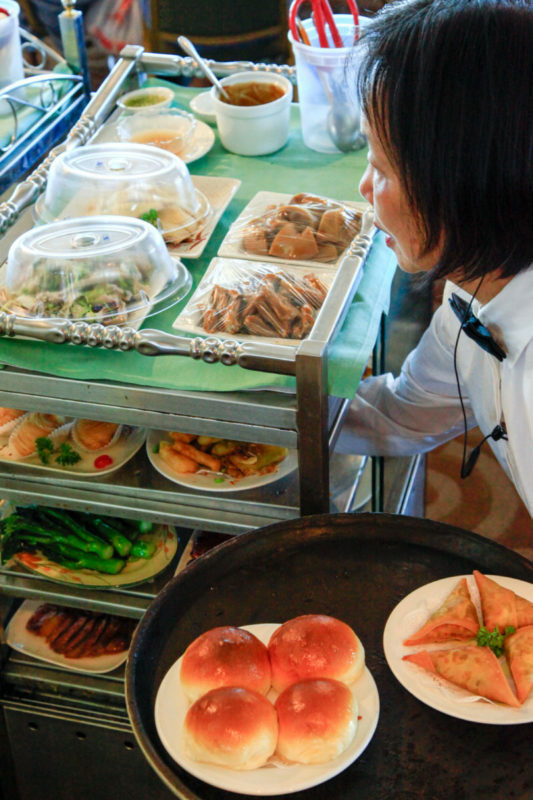 Luckily for us, our host speaks fluent Chinese and helped us choose all the best dishes. We have never had alcohol there and I am unsure if they actually sell it. The website mentions a wine list but when I clicked on it, it brought me back to the main page. That is ok, the traditional Chinese tea is what we normally go for. We started our meal with a dish of suckling pig. Honestly, I have no idea how they make the skin so crispy. 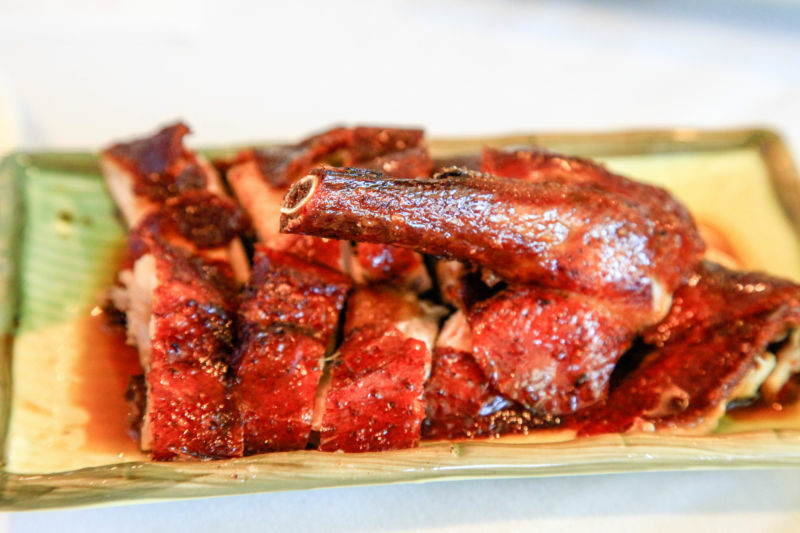 It is like a candy hard shell on a tender juicy pork. It’s amazing. I could just have dined on that deliciousness alone. 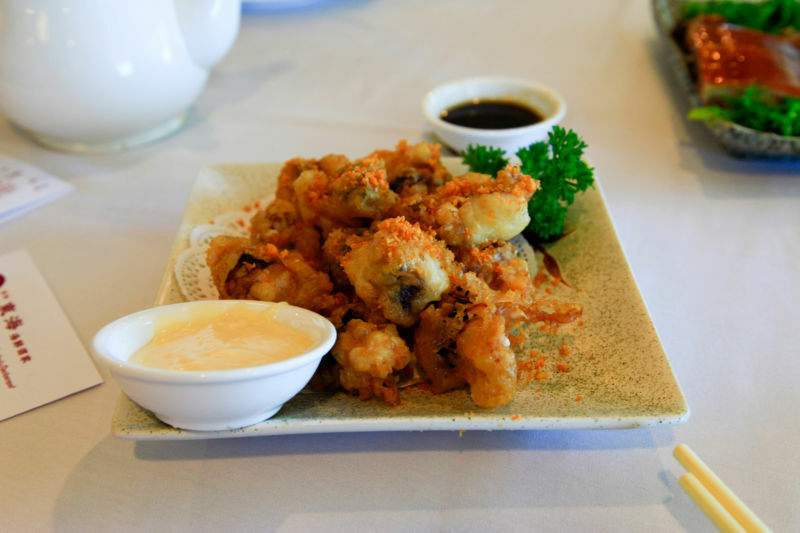 Our next dish was salt and pepper fried calamari.It was outstanding; crispy tempura type batter with a nice salt bite coating tender perfectly cooked calamari. Moving on from there we were treated to a plate of duck pieces that had been marinated in soy and ginger. You may think that the picture looks good, but believe me, it tasted even better. 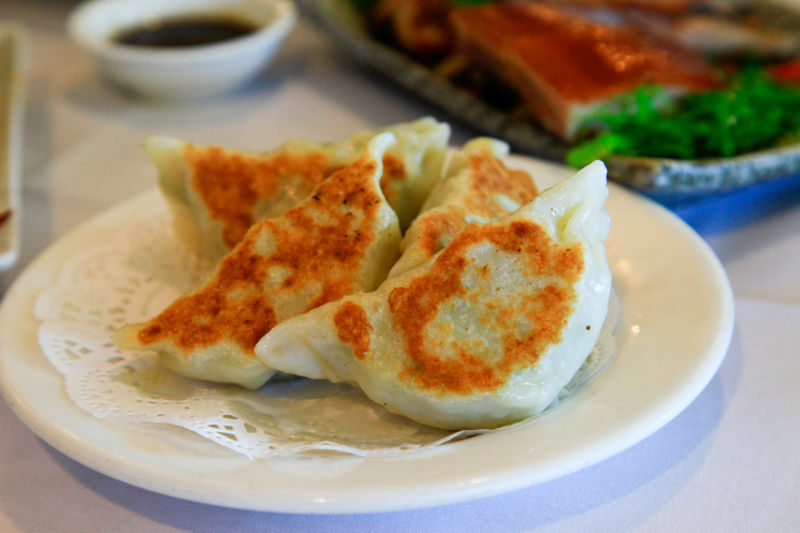 No Dim Sum would be complete without fried pot stickers. These were filled with chicken and vegetables. By this time I was really feeling full, but did this stop me? Oh heck no! Up next was fried shrimp balls. These were fried crispy wonton stuffed with a big piece of shrimp. Can you say crazy good? I couldn’t as I filled my mouth full of them. Can you believe it, the food kept on coming! The dish was stuffed noodles with shrimp. From what our friend said, this would be the equivalent to American mac and cheese; comfort food for those days when nothing else will do. I had never eaten this dish before. It was amazing and I think it has become my new favorite. I could have eaten an entire bowl of just this. The soy, ginger, noodles and shrimp accented by small pieces of chives really did it for me. 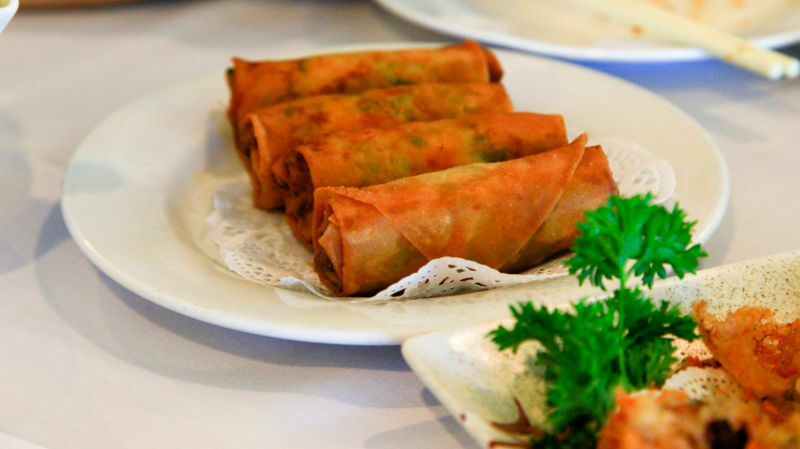 Our next dish was something that I am sure you have had before; egg rolls. They were the traditional kind filled with just veggies. 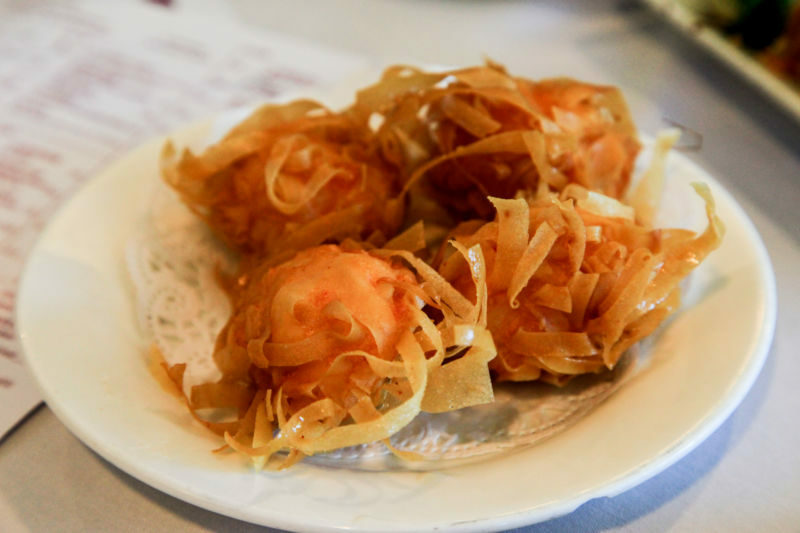 Our last savory dish was shrimp dumplings. I am not exactly sure how to describe these. 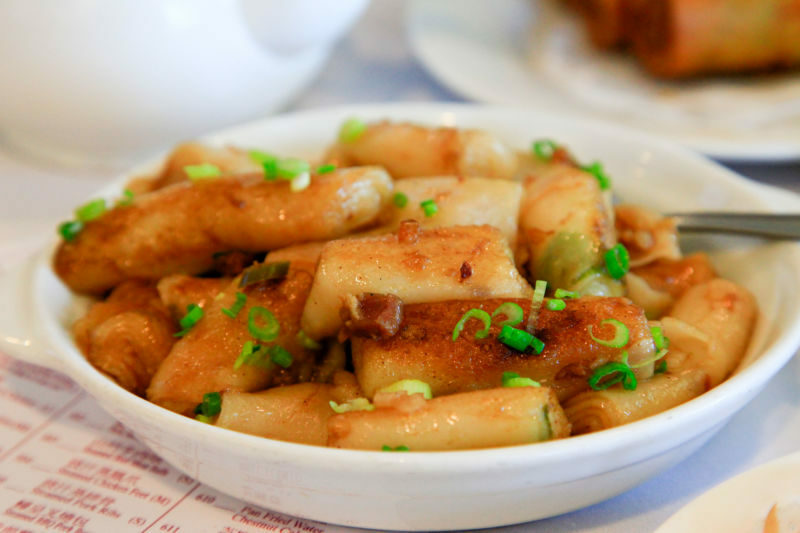 The casing for these dumplings is like a very light rice noodle filled with one big bite of steamed shrimp. They are traditional in Dim Sum menus. Finally, when we were all just about to bust we ate a sweet rice dumpling filled with spices, deep-fried, and rolled in sesame seeds. This was so unique and great. I wish I hadn’t been so full so I could have appreciated the flavors more. I was beyond stuffed by this point. The price for all of this food for 3 people was just over $100. Considering we had left overs for days, I felt it was well worth it. We did order some of the more expensive dishes on the menu. Normally, I would suggest the price to be around $25 per person for a full meal. We love this place. 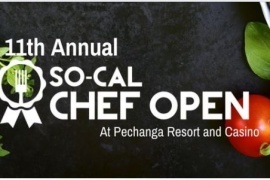 It has it all; beautiful views, nice service, and great food. What else could you want?